This is the time of Holi, a spring celebration in India also known as the Festival of Colors. According to the Hindu calendar, it typically falls at the end of February, start of March. Holi is an ancient occasion with many legends attached to it, but the overarching ideas behind the festival are the triumph of good over evil, the ushering in of spring and getting the gods on-side for good harvests throughout the year. 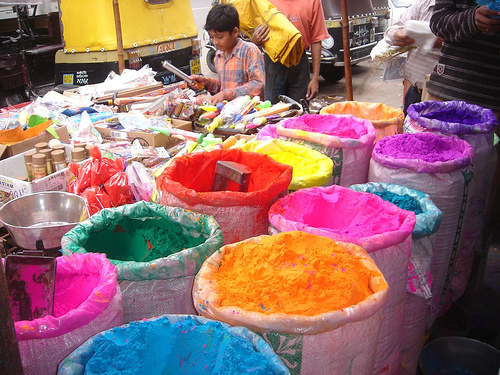 The main Holi event is an almighty clash of colors that unfolds in the thronged streets. Children and adults of all ages spill out of their houses with colored pigments in a rainbow of shades to dust, smear and coat each other top to toe, calling out “Holi Hai” as they do so. It’s also possible to drench each other with colored water, prepared with mixed dyes from the rows of pigment kiosks that line the streets at this time of year. Holi is India’s second biggest festival (after Diwali) and much-loved for its exuberance and loosening of societal rules. Mostly, it’s memorable for its intoxicating medley of colors exploding all round. There’s a wall at the NGA that’s flooded with color, albeit in a slightly more ordered way. It dates from 1993 and has a seriously long title: Wall Drawing No. 681 C / A wall divided vertically into four equal squares separated and bordered by black bands. Within each square, bands in one of four directions, each with color ink washes superimposed. This is by Sol LeWitt (1928 – 2007), an American artist who first came to public attention in the mid 1960s with “structures” (a term he preferred to “sculptures”) and big drawings like this. He was also a prolific painter and printmaker. 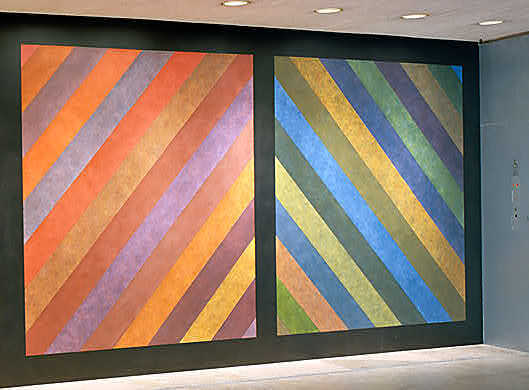 LeWitt was born in Connecticut to a family of Jewish immigrants from Russia. He travelled to Europe before serving in the Korean War, thereafter moving to New York in the 1950s to study at the School of Visual Arts. He is well known for this sort of large-scale wall drawing (in the NGA’s East Building), of which well over a thousand have been made. 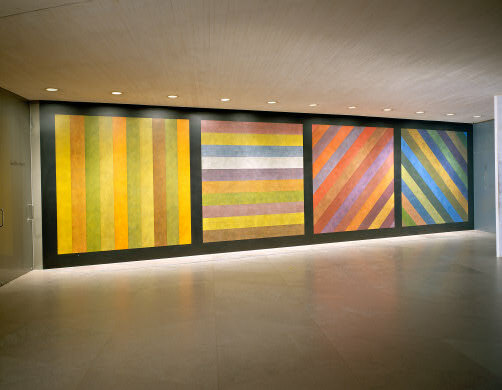 In keeping with the way he worked, LeWitt’s wall drawings are usually executed by other people, who follow detailed how-to instructions supplied by the artist. As is clear from this work, LeWitt is into line and regularity in a big way. He’s a fan of geometry and measurement, which lends his art a distinctive, clean exactitude. What’s most amazing about the strict order of this arrangement is that out of the lines and the repetition comes joy. The patterning escalates the beauty of the colors, causing them to come alive in combinations before the eye. The lines start to stress movement, revealing (for me) how a diagonal has more momentum than a horizontal. 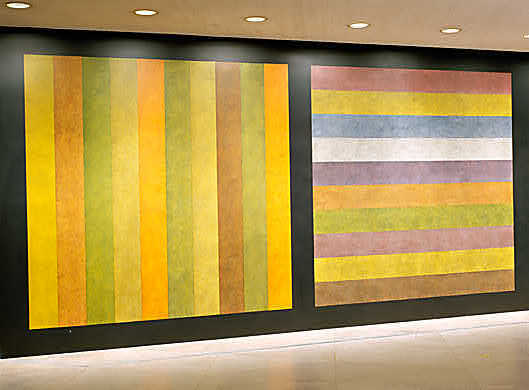 Overall, it’s a dazzling effect, not dissimilar to the fresco wall art LeWitt would have seen in Europe. Many critics described LeWitt as a Minimalist, but he himself denied this association. Instead in 1967, he coined the term “Conceptual art” to describe his work. This radical move changed the way people thought about the relationship between an idea and the art it produces. For LeWitt, art was about a concept first and foremost (manifested in the fact that he delegated the execution of his works to others), saying “Ideas cannot be owned. They belong to whoever understands them.” What an exhilarating thought, that we might get to the workings of this artist’s mind just by looking at this wall in the NGA. Failing that, it’s our very own chance to get up close with a festive flurry of vibrant colours.